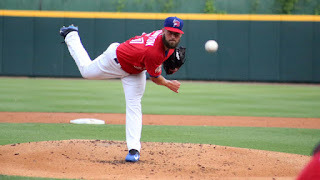 BUFFALO, N.Y. -- A low scoring affair quickly developed into a runaway victory for the Bisons as the Herd defeated the Tides from Coca-Cola Field Monday night, 8-1. A six-run seventh inning fueled by a Reese McGuire grand slam helped lift Buffalo over Norfolk. The Herd was down a run early but a Rowdy Tellez RBI-double and a sacrifice fly from Tim Lopes in the fourth allowed the Bisons to take a 2-1 lead. In the seventh, the Bisons sent ten batters to the plate and exploded for six runs on seven hits to command a seven-run edge. Urshela and Tellez both helped tack on insurance runs in the inning on RBI-singles. Reese McGuire then swiftly broke the game wide open after he belted a high fly ball to the right field corner that cleared the fence for a grand slam. "It felt good," McGuire said about the hit. "This road trip we just came back on didn't play as well as we wanted to and we know that we're a better team than what we've been in the past… we're back ready for the second half and just going to try to finish strong." Urshela has swung a hot bat since joining the Bisons. After a 3-5 game, he has now hit safely in seven of his eight games with the team and owns a .387 batting average in that span. Brandon Cumpton made his first start with the Bisons, which also marked his first Triple-A start since 2014. He put together a solid outing tossing five innings of four-hit baseball without giving up a walk. Cumpton also struck out three while only facing three batters over the minimum. The lone run against his line came in the second when he let up a solo home run to Renato Nunez. "He was awesome from pitch number one," McGuire, who caught Cumpton tonight, said about the righty. "He was attacking guys, going to use his fastball. That's his best pitch. He's aggressive with it and he's confident in it that he can throw it in any count. You love that back there as a catcher knowing the confidence he has in himself." Cumpton's fine performance on the mound enabled him to pick up his second win of the season. "[He] worked both sides of the plate, mixed in his slider when we needed it and a couple changeups here and there," McGuire added. "All in all, he just set the tone for the whole day." The Bisons' relievers that backed up Cumpton--Craig Breslow, Justin Shafer and Zach Stewart-- held the Tides hitless. "Breslow came in and did what he does, got some guys out, threw some nasty pitches," McGuire commented about the lefty reliever. "His deception is different--you don't see that a lot." "All in all, we just put it together as a team."